A Classic is Always in Style! Diamonds, pearls, a little black dress, each one a classic. They are always in style. Apple pie and variations of it fall into the same category. Our interpretation of classic apple pie belongs in that distinguished group. 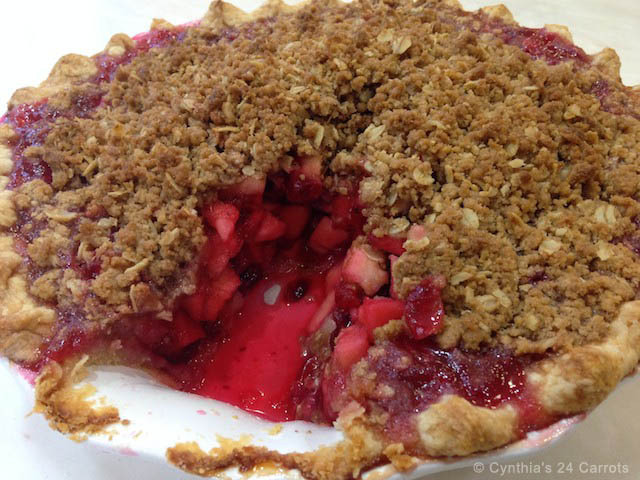 Our apple cranberry crumble pie is perfect any time. We took a traditional apple pie recipe and enhanced it by adding a homemade whole cranberry sauce to the filling in so doing making it extraordinary to serve as a dessert or as a central part of teatime. We prepared a butter based crust for this classic pie then we heaped the apple cranberry filling into it and topped it with the crumble mixture. Our pie baked at 350°F for 1 hour and 30 minutes until it was nicely browned and bubbling. During the baking, the apples melded with the cranberries which produced a slightly sweet, ruby syrup. The finished pie was both beautiful and delicious. Admittedly, this pie is labor intensive. But a few steps can be saved by purchasing a store brand pie shell and canned whole cranberry sauce. The preparation can be further simplified if you enlist friends or family to lend a hand because then peeling and chopping the apples becomes part of the fun of baking this apple pie. Your helpers will be so happy when they taste of the fruit of their labor when they bite into the pie. Our Tea for Modern Times featuring Apple Cranberry Crumble Pie incorporated a mix and match of a vintage tablecloth, every-day china, fine china and a spectacular glass cake stand to add a touch of extravagance to our simple yet classic afternoon tea. The table was set with a floral vintage tablecloth in hues of red, blue and jadeite along with white damask napkins in order to frame our afternoon tea service. Our central attraction, the pie was served on a Gorham, light blue, glass, and hobnail cake stand. The tea pot we chose was Linea’s Soho pattern which blended well with the creamer and sugar bowl by Mikasa’s Bob Van Allen’s stone white pattern. For an element of fun we selected Cath Kidston by Chruchill’s red and blue polka dot tea cups. This Tea for Modern Times was simple yet sophisticated in its use of different shapes, sizes and styles of white serving ware against a splash of color. Earl Grey tea was poured because of its subtle taste which complemented rather than competed with the taste of the pie. 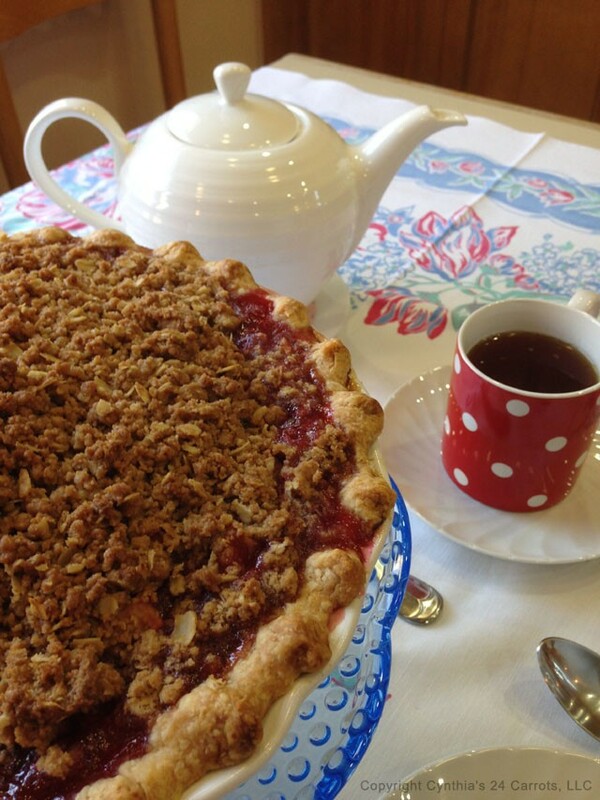 Our apple cranberry crumble pie was stunning to look at and superb in flavor and oozed of a true classic. Rinse and strain the cranberries. In a medium saucepan bring the water and sugar to a boil over a low heat. Stir constantly so the sugar does not burn. When the mixture comes to a boil add cranberries and bring to a boil then lower the heat to a rapid simmer and cook for 10 minutes or until the cranberries begin to pop. Take off from the stove and cool the mixture until it is room temperature. Set aside. Mix the first four ingredients in a medium bowl. Add butter and cut in with a pastry cutter until it resembles course meal. Set aside. In a large mixing bowl toss the apples, cranberry sauce, sugar, cinnamon and cornstarch until well blended. Add the filling to the prepared pie shell in a mound. 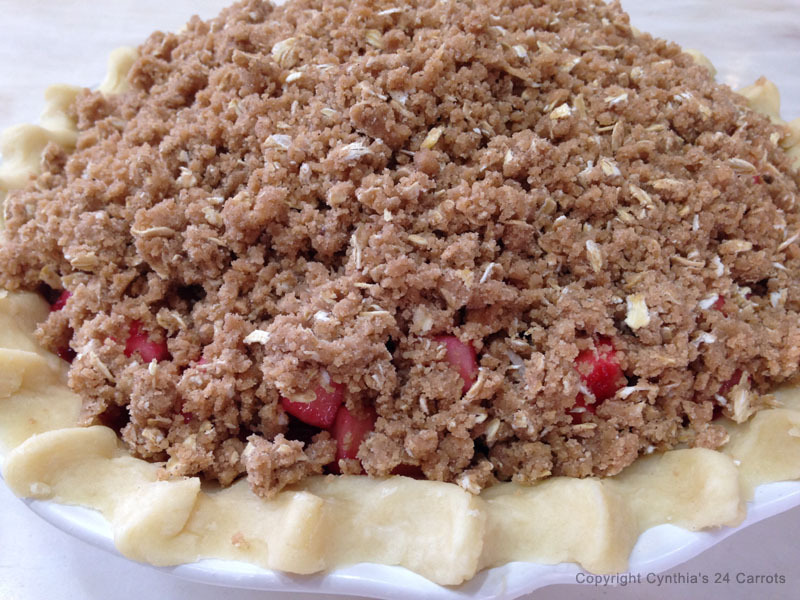 Sprinkle crumble over the pie, covering it completely. Bake in the center of the oven for approximately 1 hour and 15 minutes or until it is golden brown and bubbling. Transfer to a cooling rack for 15 minutes. Serve warm or at room temperature. Note: This recipe makes enough filling and crumble for the pie with ample left over to bake two or three miniature pies in ramekins to serve another time. A bit of advice: I followed the original directions and baked the pie directly on a baking sheet. The baking sheet did indeed collect the syrup but the pie plate was very sticky on the bottom. Instead, I recommend placing a piece of aluminum foil on the rack under the pie to catch any syrup drips in order to prevent a sticky mess in the bottom of your oven or on the pie plate. Whoopie Pies: Cakes, Cookies or Pies? © 2019 Cynthia's 24 Carrots. All Rights Reserved.